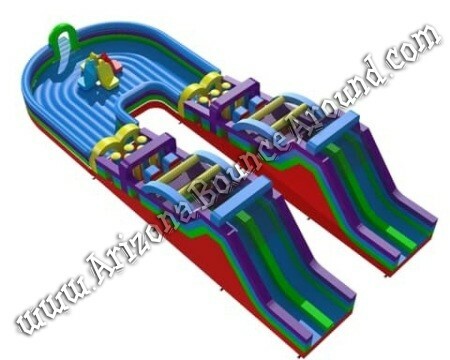 Our Cyclone Dizzy Dash Obstacle Course is way faster and exciting than it looks and the yellow stripes on the floor really get the riders confused and dizzy before the ride stops and you try to figure out where you are. 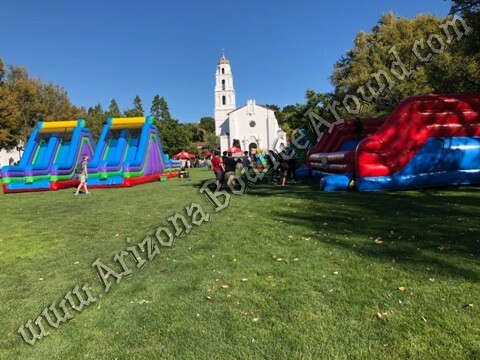 The goal is to be the first one to slide down the huge 4 lane obstacle course and claim victory but you may need a few seconds to figure out where you are after spinning 24 RPMs with your friends or coworkers. Our Cyclone Dizzy Dash is great for kids 42" or taller or adults 200 pounds or under. 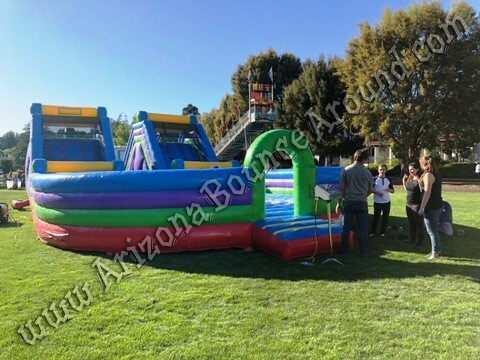 People will line up and ride this over and over again and its massive size will be sure to impress at any party or event. We have this game in 2 different color combinations shown in the photos. One is multi-color and the other in bright green and caution colors. Our Cyclone Dizzy Dash comes with 1 operator to make you dizzy but recommended to have 2 additional staff to control lines and watch the back of the obstacle course to make sure kids aren't climbing up the slide from behind. 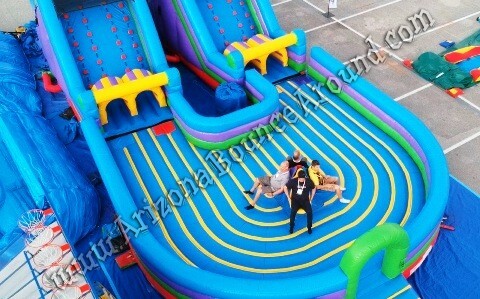 This is a perfect team building exercise or activity for work parties or team challenges so rent it today. 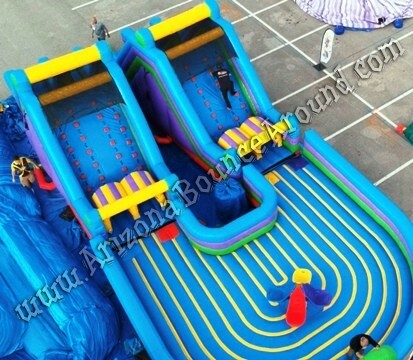 We have a huge selection of obstacle courses, challenging games and activities for any type of event like our Wipeout Big Baller, Mechanical Logrolling challenge and race tracks so don’t delay and start planning your next team building activities today with Gravity Play Events, the leader in hi-energy games & fun activities for kids and adults of all ages since 2002.